Mission Farms CBD Review 2019 | Top-Notch Quality? There are just too many different CBD brands on the market these days and we’ll be straight to the point – we believe Mission Farms is one of the most reliable brands out there. Founded relatively recently in 2018, this CBD producer owns acres of hemp farms and is based in Bend, Oregon. The eight founders of the company, all living in Bend, having failed to find positive results for their health conditions from pharmaceutical medications, turned to CBD as a natural alternative. Some of them have been hemp farmers for years. They were so impressed with the results that they began to develop their own CBD products made from organic industrial hemp. Here, we take a look and try some of their products that convinced us they are the real deal. Mission Farms stands apart from some of its competitors as it grows all the industrial hemp in its products on its own Oregon farms using only organic farming practices. Mission Farms don’t just own their own hemp farms, they also manage every aspect of the production process from the planting of the hemp seeds right through to hand-harvesting and pressing. The CBD is safely extracted via the ethanol extraction method and all the flavorings and essential oils used in their product line are certified to be organic. They outsource almost nothing (apart from their third-party lab tests of course) which gives us such great assurance that they are in complete control of their quality and processes. All of their products are third-party lab tested and rigorously quality controlled, and the test results can be found on the company website for the purchaser’s peace of mind. These reassure buyers that there are no pesticides or unwanted contaminants in the products, as well as CBD and THC values. There is virtually no THC in any Mission Farms product, and all lab testing have currently proven the THC levels to be under 0.3%, although the brand is working towards producing products which are guaranteed to be completely free of THC. As an added benefit offered by Mission Farms, there is a 30-day no questions asked return policy on all purchases. If buyers are dissatisfied with their purchase for any reason at all, they can return it and receive their money back. What sets Mission Farms apart is that their product line come in a choice of four different options which have been hand-crafted to target specific health conditions. The Mission Farms Relax CBD Soak is designed to help you relax after a long, hard day. Super easy to use, it’s simply sprinkled into a hot bath and then the goat’s milk, essential oils, and CBD in this product can get to work. The goat milk used to make this bath soak is high in MCT. Since MCT is rapidly absorbed into the skin and it also bonds well with CBD, it’s the best way to deliver CBD to the muscles quickly. As an added benefit, goat milk also contains vitamins K, E, D and A and has excellent exfoliating properties thanks to its natural lactic acid content. Although this CBD soak doesn’t contain any chemicals, preservatives, pesticides or additives, it does contain many beneficial ingredients such as organic ylang-ylang and grapefruit essential oils packed with beta-caryophyllene and linalool terpenes to reduce stress and anxiety, palm oil which is packed with antioxidants to reverse and combat UV damage to the skin, olive oil which contains essential vitamins for your skin and coconut oil to soften and moisturize the skin. As soon as I tried it once, I have to admit I always look forward to coming home after a tiring day because this CBD Soak really gave me a sense of overall calmness and peace during and after my bath. Containing all-natural essential oils and CBD, the Relieve CBD Roll-on is really simple to apply to any areas of the body which are inflamed or sore. This all-natural, chemical-free product contains 250mg of CBD and is ideal for use after a workout or by people having issues with their joints. This roll-on contains organic MCT coconut oil which delivers the CBD quickly to the joints and muscles, as well as organic peppermint, eucalyptus, and clove essential oils with their natural terpenes to help manage inflammation. I had brought this at the gym (after a long hiatus) and I did appreciate the support it gave to me after massaging it to body parts that I anticipate would be sore. With easing my soreness, I was able to get back to my gym routine easily. A convenient option for anyone looking for an easy way to take CBD, Mission Farms’ Rest, Relieve, and Relax CBD oils contain MCT coconut oil as well. The added organic essential oils add flavor while targeting health and well-being, and contain absolutely no pesticides or chemicals. A really quick method of delivery, these oils are meant to help support and manage sleep, pain, and anxiety. The oils I have to say are top-notch. I love the seamless integration of essential oils and how they enhance the flavor of the oils, making them so easy to consume for me. But more importantly, the careful selection and combination of different essential oils for different purposes are amazing and truly serve their purpose. Mission Farms’ CBD creams are packed with powerful antioxidants to combat aging, as well as anti-inflammatories to ease swelling and pain. They also contain goat milk, which is full of skin-boosting nutrients and fatty acids to lock in moisture, as well as Alpha-Hydroxy Acid to exfoliate and stimulate elastin and collagen production. For those with sensitive skin, the Pure CBD cream is the ideal choice. Unlike many other skincare products, it contains no chemicals to irritate the skin and the anti-inflammatory properties of the CBD and goat milk can bring relief to skin conditions. Mission Farms’ CBD Joint and Muscle Gel offers specific benefits of terpenes and essential oils too. The Relieve CBD gel contains eucalyptus with spearmint and peppermint, as well as rosemary and sweet basil essential oils to ease inflammation and pain and as it’s delivered through the skin, it has a rapid and direct effect. This makes it ideal for athletes following a workout or for anyone having issues with their joints. I loved alternating the Roll-On and the Relieve CBD Joint and Muscle Gel. They worked great for my workout recovery and only choosing the roll-on when I am on the go but love the Relieve Gel as my staple at home. 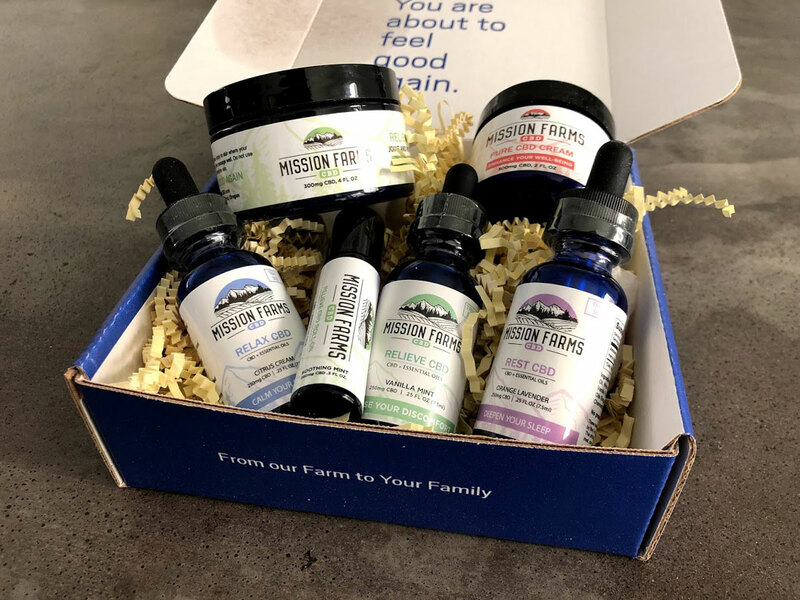 If you’re looking for high-quality CBD products made from organic industrial hemp, targeted at specific conditions, and a CBD company that is trustworthy and truly have a heart, Mission Farms is a definite choice. Their box even said – From our Farm to your Family – and we love that human touch. There is no doubt that I am including Mission Farms’ products in my routines and a great partner in achieving my goal of an overall healthy life.